Located within Mount Seymour Provincial Park, Mt. Seymour Resorts Ltd. operates a Controlled Recreation Area (CRA) comprising of the Mt Seymour ski area and parking lots. The CRA occupies 81 of 3,500 hectares of park land (approximately 2%). 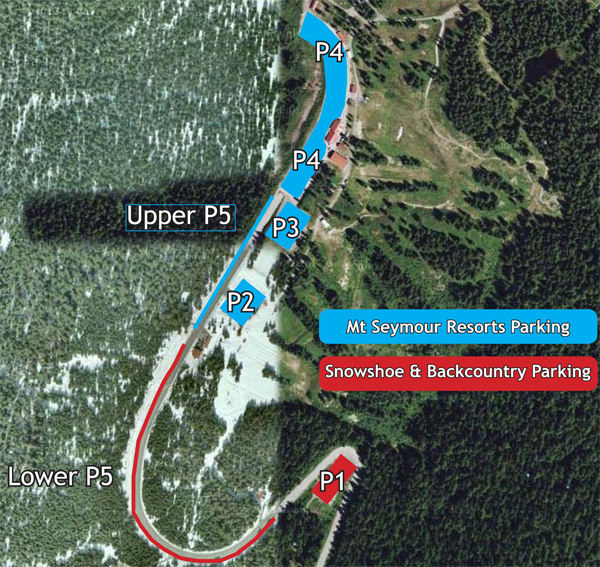 As both the Provincial Park and the Mt Seymour Resort continue to experience exponential growth with winter enthusiasts, Mt Seymour Resorts Ltd. continues to work with BC Parks to find solutions to the resulting parking shortage seen by all visitors. The following Parking Designations have been agreed upon and are implemented throughout the winter operating season. Please note: our peak periods are during weekends and holidays from December to February, when parking spaces are often in high demand. Lower P5 & P1 with overnight parking permitted in P1. When the parking lots are near or at capacity, Mt Seymour will set up a traffic stop starting at the 3.5 km mark on Mount Seymour Road, with vehicles being released at regular intervals. The stop is implemented to ease congestion within the parking lots and to efficiently manage the flow of traffic in and out of the park. To assist BC Parks and their visitors, Mt. Seymour Resorts Ltd. has created and maintains a groomed pathway on the west side of the road from Parking Lot 1 to the First Lake/Dog Mountain trailhead. This wide pathway allows backcountry users to safely access the backcountry trails. Mt. Seymour Resorts Ltd also offers a shuttle bus service from Rupert Skytrain Station in East Vancouver and Parkgate Community Centre at the bottom of the mountain. The shuttle bus is a great way to avoid parking congestion during peak periods.